So, you’ve already decided that you simply cannot afford the $1K price tag on the new iPhone X. Yeah, the Face ID and the seemingly enormous screen are pretty compelling, but there’s still that price… And even though all the hype has been over the X, the iPhone 8 is still an option if you’re looking to upgrade without spending a fortune. Now, if you’re upgrading from the 6 or 6s from to the 8 you’re going to see a world of difference. But what about if you’re just going from the iPhone 7 to the iPhone 8? Is it worth upgrading? Let’s find out! By looking at photos of the 2 phones they appear to be virtually identical, except for one major detail: the back of the iPhone 8 is made of glass. Yes, just like the iPhone X that you’ve heard so much about, the iPhone 8 also has a glass back. More to crack? Oh, joy! This change makes that phone .2mm thicker, which you’ll probably never notice, but what you might notice is the weight. The glass backing makes the iPhone 8 is 7% heavier than it’s predecessor. Moving on to displays… really not much to report here though. The only difference is that the iPhone 8 has received the “True Tone” display technology that debuted on the iPad Pro. What does that mean? If you haven’t heard of True Tone technology it basically means that the color on the screen is always reacting to the surrounding lighting to give you the most accurate color balance. Other than that, not much of a difference. Here’s something that you might get a little excited about: wireless charging. It does NOT come with a wireless charger. That’s something that you’ll have to buy separately. In the box you’ll get a standard lightning to USB cable and wall power adapter to charge your phone. There’s also a “fast charging” option that’s supported by the iPhone 8. Great right?! Except there’s another catch it uses USB-C, meaning you’ll need a different cable and different power adapter! Purchasing both of those from Apple will set you back another $75. In case you were curious about the battery life, it lasts exactly as long as the iPhone 7. So far, we’re not too sure the upgrade is worth it. This is where the iPhone 8 starts to set itself apart with the new All Bionic chip. 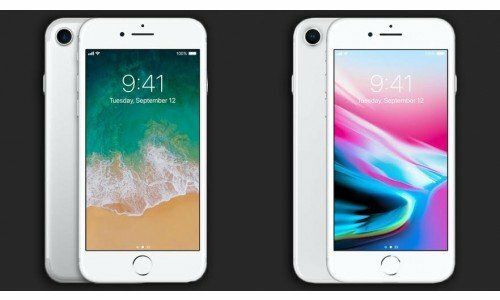 The iPhone 8 and 8 Plus are nearly equal in performance to the iPhone X. And according to Apple, that means a 25% faster when performing at high-efficiency, and up to 70% faster when multitasking and hopping between apps when compared to the iPhone 7. Camera: Same Camera, Better Photos? The specs on the 8’s camera are identical to the 7, but what sets it apart is the A11 chip we mentioned before. The improvements promised include: faster low-light focus and noise reduction. Both things I think we could all agree needed an upgrade on the iPhone 7! Unless you’re upgrading from an iPhone 6 or 6s, the improvements (mainly faster performance and camera) just aren’t quite worth the nearly $700 price tag. Oh, and if you’re considering the iPhone 8 Plus, you’re looking at nearly $800 for the cheapest model. If you REALLY want to upgrade, hold off and save up a little longer for that iPhone X! And then find your way back over here to get the best price on your old phone. Find out how much your phone is currently worth here.